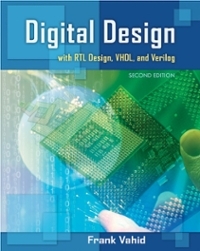 Digital Design with RTL Design, Verilog and VHDL 2 Edition An eagerly anticipated, up-to-date guide to essential digital design fundamentals Offering a modern, updated approach to digital design, this much-needed book reviews basic design fundamentals before diving into specific details of design optimization. You begin with an examination of the low-levels of design, noting a clear distinction between design and gate-level minimization. The author then progresses to the key uses of digital design today, and how it is used to build high-performance alternatives to software. Offers a fresh, up-to-date approach to digital design, whereas most literature available is sorely outdated Progresses though low levels of design, making a clear distinction between design and gate-level minimization Addresses the various uses of digital design today Enables you to gain a clearer understanding of applying digital design to your life With this book by your side, you'll gain a better understanding of how to apply the material in the book to real-world scenarios.